One of the great things about tragus piercings is that they are perfectly placed to make a show off cute jewellery. These gorgeous pieces of tragus piercing jewellery make it easy to show off your piercing and get a sweet new look. 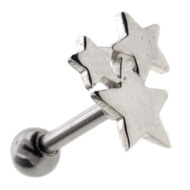 We have a huge choice of tragus piercing jewellery, from petite barbells and studs to small size BCRs. You can wear a barbell, curved barbell, BCR, circular barbell or labret stud in your tragus piercing, so the choice really is endless. 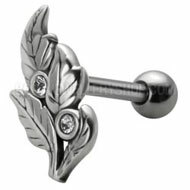 Treat your piercing to elegant style with our range of silver tragus piercing jewellery. 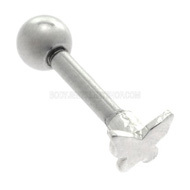 These studs feature solid silver charms on high quality surgical steel studs. 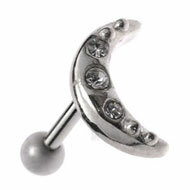 This means that you get a comfortable feel for your piercing, and beautiful shine for your look. We have lots of different silver designs, but the studs below are some of our most popular. If you want to show off your tragus piercing, nothing beats something sparkly! 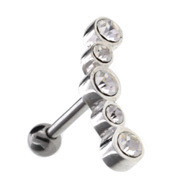 These jewelled tragus bars look beautiful in your piercing and add a touch of glamour to your outfit. 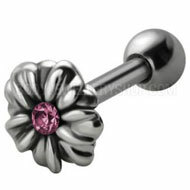 They all feature surgical steel bars that feel comfortable to wear and won’t irritate your piercing. 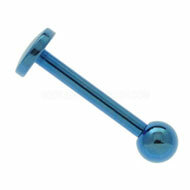 We also have a great range of UV, polished steel and silver tragus bars to choose from. This entry was posted in Ear Studs and Earrings and tagged Tragus Jewellery, Tragus Piercing Bars, Tragus Piercing Jewellery, Tragus Piercing Studs, Tragus Studs on May 31, 2013 by Piercing Guru. 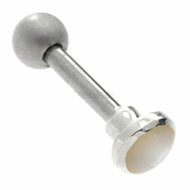 Keep your piercings as stylish as the rest of your wardrobe with our range of chic pearl piercing bars. These pieces combine high quality piercing jewellery with designs that are usually associated with fine jewellery. If you like elegant sterling silver, pearl and diamond jewellery, these pieces are the perfect way to give your piercings the same look. Our pearl piercing jewellery is beautifully made and affordably priced, allowing you to give all your piercings a new look for less. Love pearl earrings? 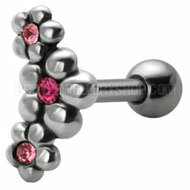 Then you’ll love our pearl tragus piercing bars. They look wonderful paired with pearl studs and continue the look across your whole ear. 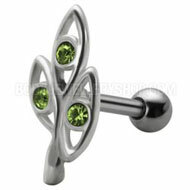 These tragus bars feature surgical steel bars with sterling silver settings for the pearls. The sterling silver has a beautiful shine and adds to the natural lustre of the pearls, giving you a stunning look. 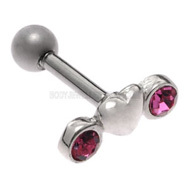 Show off your belly button piercing with one of our beautiful pearl belly button piercing bars. We have over 20 different pearl belly bars, including sterling silver designs and coloured pearls for a cute look. The pearls catch the light beautifully, drawing attention to your belly button and adding a touch of glamour to your outfit. Alternatively, you can use our threaded pearl balls to update your existing jewellery. These inexpensive pearl balls come in natural cream, white, grey, pink and blue, as well as a special internally threaded pearl ball. You can attach them to almost any piece of threaded piercing jewellery, allowing you to customise your jewellery however you like. This entry was posted in Ear Studs and Earrings, Navel Bananabells and tagged Belly Button Bars, Belly Button Jewellery, Pearl Piercing Jewellery, Tragus Piercing Bars, Tragus Piercing Jewellery on January 8, 2013 by Piercing Guru. 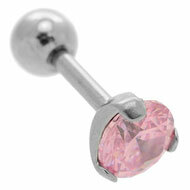 If you fancy a cute update for your tragus piercing, look no further than our gorgeous pink tragus bars! We have a great range of tragus jewellery and these are some of my favourite pieces. These bars are combine fabulous style with designs that are comfortable and easy to wear. Whether you fancy a hint of soft pink or something a little more eye-catching, these tragus bars are the perfect way to complete your look. We all love a little sparkle and these jewelled tragus studs are the perfect way to get it. 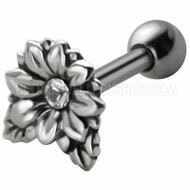 All three studs feature solid silver designs mounted on high quality surgical steel stems. This means that they feel great in your piercing. They are super-sparkly and make it easy to add glamour to your tragus piercing. 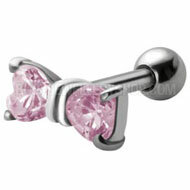 If you prefer something a little subtler, take a look at these pink pearl tragus bars. 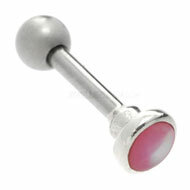 These bars feature pink mother of pearl set in silver, mounted on a 316L surgical steel stem. The mother of pearl has a lovely shine to it and looks very pretty against your skin. 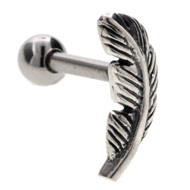 They are a lovely addition to your piercing and could also be worn in ear lobe or ear rim piercings. 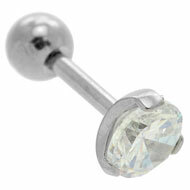 All three tragus bars are also available in white mother of pearl. This entry was posted in Ear Piercings, Ear Studs and Earrings and tagged Tragus Bars, Tragus Jewellery, Tragus Piercing Bars, Tragus Piercing Jewellery, Tragus Piercing Studs, Tragus Studs on March 10, 2012 by Piercing Guru. Refresh your style with one of our gorgeous blue tragus piercing studs. A pop of colour is the perfect way to reinvigorate your look and pep up your style. These blue tragus studs give you that bright spot of colour and come in fabulous styles to suit your look. Whether you want something discrete or super glamorous, our range of tragus piercing studs has something for you. 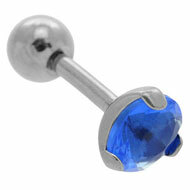 Below are three of our best-selling blue studs. 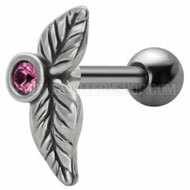 The all look gorgeous in your tragus piercing and have just the right amount of eye-catching colour. 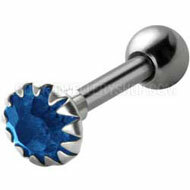 The blue titanium stud is a great everyday stud and the blue colour makes it that little bit more special. If your piercing is easily irritated I would recommend the stud in the middle. Its stem is made from Bioplast, a clever material that is completely non-irritating and good for healing stubborn piercings. And for all you attention-seekers, you can’t beat a bit of UV glow! If you want a glamorous new look, you can’t go wrong with a little bit of sparkle! 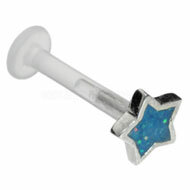 These jewelled tragus studs feature bright blue gems that catch the light and really stand out. They look wonderful in your piercing and light up your look every time. This entry was posted in Ear Piercings, Ear Studs and Earrings and tagged Tragus Bars, Tragus Jewellery, Tragus Piercing Bars, Tragus Piercing Jewellery, Tragus Piercing Studs, Tragus Studs on February 11, 2012 by Piercing Guru. Add a little sparkle to your look with one of our gorgeous new jewelled tragus studs! Because a tragus piercing frames your face, a jewelled stud will go a long way to light up your look. We have a fabulous choice of jewelled tragus studs and bars so suit any style, from simple and understated to full on glamour. Keep it classic with these chic tragus studs with clear jewels. The clear sparkle looks glamorous and goes with any outfit or jewellery. They are all made from polished steel and silver with a bright shine that is very eye-catching, the perfect way to show off your tragus piercing. Spice up your style with these super cute coloured jewel tragus studs. We have a whole rainbow of jewelled tragus studs so you can coordinate them with your whole look. The colourful jewels look gorgeous and turn your tragus piercing into a super-cute statement. This entry was posted in Ear Piercings, Ear Studs and Earrings and tagged Tragus Bars, Tragus Jewellery, Tragus Piercing Bars, Tragus Piercing Jewellery, Tragus Piercing Studs, Tragus Studs on February 3, 2012 by Piercing Guru.